LICENSING AND REGISTRATION – Before going into any business in the medical line, you must have acquired certification on the basic requirement to start and run a medical business or a license to enable you operate in the medical line so without a license or any kind of qualification, you cannot have a medical laboratory business in Nigeria. But if you currently do not have the license or certificate and do not wish to go through the trouble of attending a medical school, not to worry, there is always a way around it. You could make someone already in the field one of your board member or better still,you could partner with the person. planning is a very important part in starting a med lab business before starting this business, you must have a step by step detailed outline that you will follow to run a successful medical laboratory business. there should be checkpoints which will serve as yardsticks to measure the progress of your business.this will help you measure your project in a scale of where it is to where you envision it to be in the nearest future. COST – You might need a huge capital to start up this business because it is capital intensive depending on how big you want to start and how big you want your business to be and you will also need both human and material resources to invest as you start up your business.so you should be able to identify,calculate and approximate how much it will cost you in investing in this business. LEGAL REQUIREMENT – The first step in creating a legal identity for your business is by having it registered with corporate affairs commission of Nigeria CAC, and it is also important for your business to be registered with the medical bodies. HAVE A GOOD MARKET STRATEGY – Your marketing strategy should involve making the services you can render known to the patients and doctors either by banners, newspapers, adverts and other modes of advertisement,and also getting in contact with the potential referees to refer their own customers to you. ACQUISITION – You will need to acquire instruments and equipment that you will need to run your systems effectively. This equipment has to be high grade that are accurate and inn serviceable condition. These equipment include but are not limited to dialysis machine, weight and scales, diagnosis, office and laboratory cabinets, laboratory stools, Bunsen burner, laboratories consumables like gloves, tubes etc. You will also consider the size of the location, because you would need an admission center, a test lab, storage unit among others and you would need a spacious center to ensure a good mobility of staff and customer as much as possible. ENSURE TO GET GOOD STAFFS – Staffing is an important aspect of the business.the first qualification is to be certified,then experience, and then have good customer relationship. You should ensure to get experienced staff in your lab. So in each department, you should have at least one experienced personnel to oversee others since experienced staff cost more than getting say a graduate assistant or a fresh graduate. Finally, to succeed in this business, you will need to find a location that accommodate your lab equipment, has a sufficient water supply and power, check with the health sector for proper registration and licensing, employ qualified personnel and advertise your business. This business is very profitable,and once the capital intensive investment have been made, and a light investment on the reagents and consumables have been catered for, the testing will actually generate immense profit. You should also remember that science and technology is improving very fast with rapid advancement, so you will need to constantly update yourself so as to stay ahead in the medical field. Our sample MEDICAL DIAGNOSTIC BUSINESS PLAN IN NIGERIA can be used to access bank loans, proposal writing and grant applications. The business plan was complied after a thorough feasibility study on MEDICAL DIAGNOSTIC BUSINESS IN NIGERIA was done. 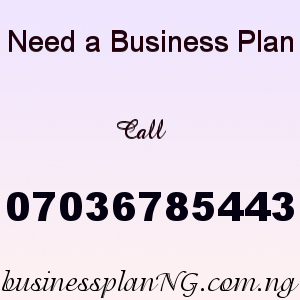 After payment text your name and e-mail address to 07036785443 and you’ll receive your MEDICAL DIAGNOSTIC BUSINESS PLAN IN NIGERIA.